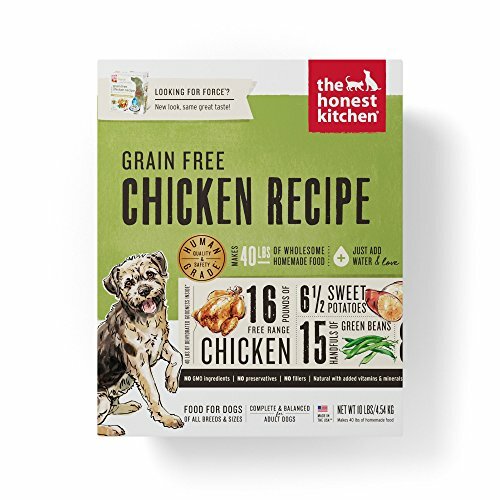 The Honest Kitchen Force dog food is a dog food to be reckoned with. Packed with delicious, healthy produce and free-range chicken, it’s perfect for picky eaters and any hound who can’t stomach gluten, grains or too many calories in one sitting. Force is a dehydrated dog food that is AAFCO complete and balanced for adult dogs. It is moderate in protein and fat so it's perfect for adult dog maintenance, senior dogs and dogs who need a little help with weight loss. Force is also a grain-free dog food so it's ideal for dogs who have food allergies or sensitivities to grains and gluten. This dog food is 100% human-grade dog food (an important quality distinction!) and contains no red flag pet food ingredients like corn, soy, rice, beet pulp or wheat. Just add warm water, wait 3 minutes and serve a delicious & healthy meal! The Honest Kitchen started in Lucy Postin’s kitchen in 2002 when she started making her dog’s meals from scratch to help combat his ear infections. The difference from his new diet was spectacular but her kitchen was a mess! Lucy then realized that dehydrating whole food ingredients made mealtimes much simpler while maintaining the natural health benefits. From there, The Honest Kitchen was born - and her kitchen stayed much cleaner! MODERATE PROTEIN: Balanced levels of calories and carbs make it the perfect maintance diet for adult dogs of all breeds & sizes, especially picky eaters.